All Buddhist schools today despite their differences in ritual, doctrine, and practice are based on the original teachings of the Buddha Shakyamuni, Prince Siddhartha Gautama, who became enlightened at approximately the age of 35 whilst sitting under the Bodhi tree in Bodhgaya, northern India, about 2600 years ago. ‘Enlightenment’ is the most common translation of the Sanskrit term ‘bodhi,’ in Japanese ‘satori’ or ‘kensho,’ which means awakening and should not be confused with the western idea of intellectual enlightenment which means ‘informed, aware, knowledgeable, illuminated’ and so on. In Buddhism, enlightenment is the state that marks the culmination of the Buddhist religious path as established by Buddha Shakyamuni. The release from human suffering and continual rebirths, known in Indian religions as the world of ‘samsara,’ is Nirvana (Skt: moksha or mukti; Pali: Nirbanna) which literally means the ‘blowing out’ or ‘extinguishing’ of all human cravings. This is recognised as a state of perfect quietude, freedom, and the highest form of happiness which all humans are seeking. But in Buddhism, this liberation refers to a realisation of non-self (Skt: anatta) and emptiness (Skt: shunyata) which bring an escape from samsara. To fully understand the diversity of Buddhist schools, it is important to recognise the Dharmachakra (Skt: wheel of the law with eight spokes) which represents the Eightfold Path (Right View, Right Resolve, Right Speech, Right Actions, Right Occupation, Right Effort, Right Mindfulness, and Right Concentration). This wheel turns eternally with no beginning or end and is significant because it was the theme of the very first sermon Buddha gave, ‘Setting in Motion of Wheel of Law’ (Dharmacakrapravartana Sutra) in which he sets out the Four Noble Truths (first: suffering is inevitable in human life; second: suffering arises due to attachment; third: suffering ceases with the attainment of Nirvana; fourth: the Eightfold Path described above). At this time, Buddha predicted two more turnings of the Wheel of Dharma to suit the condition of humans as time went by. The second would be Mahayana Buddhism and the third Vajrayana Buddhism. The first turning of the wheel was Thervada. This is the oldest and most orthodox of the Buddhist schools and is known also as the ‘Teaching of the Elders or Hearers’ (Skt: Hinayana or Sthavira school). Originating in Sri Lanka, it is characterized by a strong division between monks and lay practitioners: the monks meditate, study, and teach, working for individual enlightenment, while the laity follows the basic five precepts (refraining from harming living beings, from stealing, from sexual misconduct, from lying/gossip, and from intoxication, e.g. drugs/drinks), gives alms, makes donations, chants and offers prayers. In summary, these teachings are plain and guide aspirants to abstain from evil, accumulate good, and purify the mind. They focus on the human Buddha and the Three Trainings: ethical conduct, meditation, and insight wisdom. 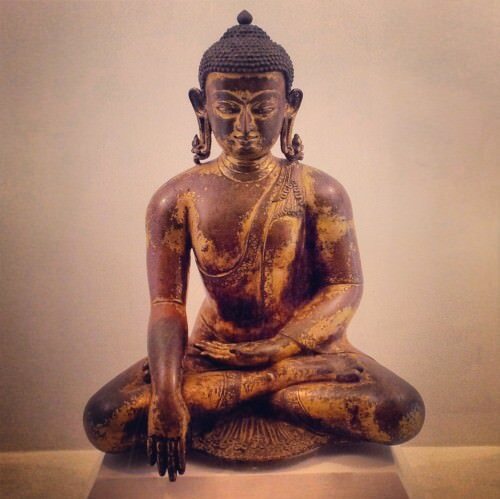 The key figure in Theravada Buddhism is Buddhaghosa, and the key text is Visuddhimagga (‘The Path of Purification’). The ideal of this individual path is the arhat or worthy person, but this may take several lifetimes to achieve. Theravada practitioners aim for a life in which all birth is at an end, holy life is fully achieved, where all that has to be done has been done, and there is no more returning to worldly life. The texts of this Early Period, written in Pali which is thought to be the spoken language of the Buddha, are called Pali Canon, although Thervadans acknowledge all sutras from the following wheel-turnings also. Its limitations may be said to be that the figure of the Buddha is remote to practitioners, that it may take several lifetimes to become an arhat and women are, even today, thought of as inferior. The second turning of the wheel was Mahayana, known also as the Mahayanas, (the ‘Great Vehicle’ or ‘Truth’) a movement of diverse teachings systematised by Nagarjuna c. 2nd century CE. It follows the basic Theravada structure, but the demarcation between the monks and lay practitioners is blurred because all beings can become equally enlightened. The body of Mahayana sutras, the Wisdom Sutras, has seen many cultural adaptations due to the spread of Buddhism to the north to Nepal and Tibet and east to northern and southern Asia. Stupas, depositories for relics of Holy Beings and sacred texts, appeared, maintained and patronised by lay practitioners; and ideal became the Bodhisattva, a being who served all humanity and put their own enlightenment aside. The figure of the Buddha became supernatural with many aspects or emanations. All beings can reach Nirvana within their lifetime through meditation, rituals, and chanting because all beings contain the seed of Buddhahood, Buddha Nature. Mahayana Buddhists work towards the salvation of all who sincerely seek enlightenment, monks and laity alike, therefore, compassion and wisdom are towering values and the Bodhisattva ideal dominates all practice. Its limitations may be said to be that enlightenment is often perceived as a goal rather than a step in a much larger process and rituals and practice are so elaborate that the life of suffering may easily be forgotten and practitioners instead become attached to life. The third turning of the wheel was Vajrayana (‘Diamond Vehicle’), an extension of the Mahayana Buddhism, also known also as Tantric or Esoteric Buddhism, which came into existence circa 700 CE. Vajra is a thunderbolt used the symbolise the imperishable nature of enlightenment. Tibet has always been isolated with its mountainous terrain, few natural resources and tiny population, but there were three diffusions of Buddhism: first, at the hand of Songsten Gampo, the first religious king who had an Indian and Chinese wife who were acquainted with Buddhism; the second, King Trisong Detsen who invited Santaraksita from India to promulgate the teachings, succeeded by Padmasambhava, a powerful guru who established the first monastery; and the third, King Relpa Chen was assassinated and succeeded by Lang Darma, but quickly followed by the great Atisha (982-1054), an Indian teacher, who perfected the Buddhist system in Tibet. VAJRAYANA BUDDHISTS ASPIRE TO BECOME BODHISATTVAS, TAKING THEIR INNATE BUDDHA NATURE AS THE STARTING POINT. In the 20th century CE, Tibet was invaded by China, leading to the political and spiritual leader, the Dalai Lama, fleeing to India. Over 6,000 monasteries in Tibet were destroyed. Since then Tibetan Buddhism has become an international practice led by Tibetan gurus resident in UK, US, and many parts of Europe. Vajrayana Buddhists aspire to become Bodhisattvas, taking their innate Buddha Nature as the starting point. Employing tantric techniques, the practitioner works to attain the empty nature of the enlightened mind and to purify all perceptions so that they can see the ultimate truth. Its limitations are that Vajrayana Buddhists can be boastful and competitive and the four main schools constantly fight for supremacy. This school also tends to value myth more highly than history and the rituals are complex because of the inherited indigenous practices of Tibet (Bon and other superstitious beliefs). After the Buddha’s death, his disciples worked hard to disseminate his teachings. In 480 BCE, the First Council meeting was held led by Mahakassyapa, Ananda, and Upali, those disciples closest to the Buddha. As a result, the teachings of Buddha were then codified and later recorded in writings known as the sutras. The Second Council was held in 350 BCE mainly to stamp out heresy which was growing among the followers. Due to unrest, this is when the first major rift appeared in the sangha (the community of monks) led by Mahadeva who protested against the arrogance of the elite, in other words, the enlightened, who still had many shortcomings but had become complacent. This is when the first and second turnings of the wheel of Dharma can be traced back to. Madhyamaka, or the Middle School, was founded by the first great name in Buddhism, Nagarjuna c. 2nd century BCE, about whom little is known. This school, which claimed to be faithful in spirit to the original teachings of the Buddha Shakyamuni, advocated the Middle Way between extreme practices and theories, for example, either that ‘things exist’ or ‘things do not exist,’ believing the essence of the Dharma lay in between the extremes. Debate was popular then, so the strategy of attacking the opposite views rather than defending their own was adopted. Through this intellectual process, reality became like a film strip, each independent frame constantly giving way to the next producing the illusion of stability and continuity. Their conclusion was that the true nature of phenomena can only be described as emptiness which is synonymous with the doctrine of Dependent Origination (Skt: Pratityasamutpada) – all phenomena arise because they depend on causes and conditions and therefore lack intrinsic being, i.e. when A exists, B arises. If A does not exist, B does not arise. This reasoning is set out in the root text of this school, Mulamadhyamakakarika. The important implication for the future of Buddhism was that if emptiness is the true nature of everything that exists, there is no difference between samsara and Nirvana and any difference that is perceived must come from ignorance or misconception. Therefore, Madhyamaka suggests there are two levels of truth: the Ultimate Truth (the view of the enlightened); and the Relative or Veiled level of Truth (the view of the unenlightened). After Nagarjuna, his disciple Aryadeva continued to develop the school. But later there was a division in this school leading to two branches of Madhyamaka: the Svatantrika and the Prasangika. These systems were transmitted from India to Tibet and East Asia. In China, it was known as San-lun (the three treatises school), but due to its negative doctrines, it was heavily criticised by Buddhists and non-Buddhists and eventually converged with the Yogacara School. The Yogacara School (or Yogachara), which practised yoga, emerged in the 4th century CE. This school is also known as Vijnanavada or the ‘Way of Consciousness.’ Its origins are shrouded in mystery, and its founders were Maitrayanatha, Asanga, and Vasubandhu. It flourished in India until the 8th century CE when it combined with the best elements of the Madhyamaka. It was transmitted to China through the efforts of Paramartha and Hsuan-tsang and was also introduced and widely studied in Tibet. ￼The key scriptures are the Sandhinirmocana Sutra, Dasabhumika Sutra and the Avatamsaka Sutra. Many Buddhist classics are attributed to this period, but the encyclopaedic Yogacarabhumi Sastra is perhaps the best known attributed to the three founders. Its doctrines and theories are derived from meditational experiences and focus on two themes: the nature of the mind and the nature of experience. Eight aspects of consciousness were distinguished: the afflicted mind, the six perceptual consciousnesses of eye, ear, nose, tongue, body, and thought; deluded awareness a result of self-grasping; and the all-encompassing foundation consciousness, the result of memory. Rebirth in samsara leaves a string of imprints derived from experiences and actions which will eventually ripen when the conditions are right to produce dualistic delusions of subject and object. This gives rise to the production of a false self and the potential production of more imprints. There are three natures: the imagined, the dependent, and the consummate. At enlightenment, a radical transformation occurs creating a mirror-like Awareness. Yogacara also contributed to a refining of the Three Bodies (trikaya), the Five Awarenesses and brought to prominence the ten stages of Bodhi, that of a Bodhisattva being the most important. Pure Land Buddhism. There are Pure Land Schools in both China and Japan. It comes from the term Buddha-land or Buddha-field, a Mahayana term describing the idea that when beings become enlightened they do not disappear but remain to help others. Each of the five Buddhas, the Five Dhyani Buddhas, was assigned a different colour, wisdom, and realm in early 19th century CE, as follows: white Buddha Vairochana in the centre; green Amoghasiddhi in the north; red Amitabha in the west; yellow Ratnasambhava in the south, and blue Akshobya in the east. In Esoteric Buddhism, these areas of the Cosmos were charted on sacred maps known as mandalas, but although outside samsara, the human world, they were not to be confused with the idea of heaven. These practices have become very popular in the west. Zen. The Chinese word ‘Ch’an’ means meditation and is pronounced ‘Zen’ in Japanese. Zen is comprised of a number of particular religious techniques and is an umbrella term for various schools of Zen in Japan: Rinzai, Soto, Obaku, and Fuke. Zen is also used to cover the whole tradition of Ch’an in China and other countries such as Vietnam and Korea. Its main practice is seated meditation (zazen)’ and koans or riddles, brief stories or dialogues from the Ch’an tradition, which are used as the main focus of meditation. Zen is famous for austerity and aggressive teaching techniques, including shouting and beating, which shock practitioners into awakening. Tendai. One of the major schools of Japanese Buddhism that appeared between 794-1185 CE. It was founded by the monk Saicho who brought the Chinese teachings of T’ien-t’ai to Japan and is widely eclectic embracing both Esoteric rituals, Exoteric studies in doctrine and scripture, and early forms of Zen and Pure Land. Unlike Shingon Buddhism established by Kukai at the same time, Tendai was patronised by the imperial family and became wealthy. This made it a breeding ground for new reform movements such as Zen, Pure Land, Nichiren and combined with corruption and military conflicts caused it to recede into the background. It was eclipsed by the newer schools and today is a minor sect. Nichren-shu. Nichiren (1222-1282 CE) was the first non-aristocratic leader of a Japanese Buddhist sect which may account for his uncompromising style of religion. Ordained as a Tendai priest which championed the Lotus Sutra, the penultimate teachings of Buddha Shakyamuni, he is famous for promoting his views and openly attacking the teachings of other schools which were considered intolerant and arrogant. As a result of this behaviour, he was exiled to remote islands several times and heavily persecuted. According to him, the Daimoku mantra – ‘Namo myoho renge kyo’ – was the sole chant and only practice. There have been many divisions in this sect, and in 1937 CE, one of the most successful and controversial, Soka Gakkai International, has evolved into the third largest political party in Japan, blending politics and religion together. The Order of Interbeing. Thich Nhat Hanh, the international Vietnamese peace activist established this international order in 1966 CE. It is a mixed lay and monastic group which now has its headquarters in Plum Village, the Dordogne region of southern France. Hanh also established the Unified Buddhist Churches of France and Vietnam and coined the term ‘Engaged Buddhism,’ meaning Buddhism in action in a society promoting the non-violent solutions to conflict of the individual. He has published over 100 books, 40 of which are written originally in English. This term was inspired by a 13th-century CE king of Vietnam who abdicated his throne to become a monk and founded the School of the Bamboo Forest tradition. In 1960, Hanh was exiled from Vietnam at the outbreak of the Vietnam War, going to study comparative religions at Princeton, and eventually returned to Vietnam in 1963 to aid his fellow practitioners in non-violent peace efforts. His approach combines traditional Zen teachings with insights from other Mahayana and Theravada traditions, offering modern meditation techniques and strategies. Today, in the 21st century CE, Secular Buddhism, which focuses on Buddhism as an applied philosophy rather than a religion, is gaining ground. This is based on humanistic values rather than religious. It looks closely at how we see the world as individuals and how to change that view. Linden is a ValidLit writer/teacher living in Japan. Ordained as a Buddhist Priest, she is a Dharma/Meditation teacher working to make the ideas of Buddha Nature accessible to everyone, which involves many thousands of years of historical research. Keown, D., A Dictionary of Buddhism (Oxford University Press, 2008). Shambhala Publications, Radical Compassion (Shambhala, 2014). Thich Nhat Hanh, Buddha Mind, Buddha Body (Parallax Press, 2003). Thurman, R.A.F., Essential Tibetan Buddhism (HarperOne, 1996). Tuffley, D., The Essence of Buddhism (Altiora Publications, 2013). Williams, P., Mahayana Buddhism (Routledge, 2008). I really recommend this free encyclopedia if you are interested in ancient history! It has just won an award for best web-site of the year. This shows how words and images have replaced direct experience of life. A group of people meeting each other for the first time sit in a room in a circle. They are asked not to speak but just to look around. As they look out at each other and their environment, all of them start to whisper descriptions of their circle mates inside their heads, some complimentary, some not. Meanwhile their masks smile and they long to talk with rough words which will somehow help them to learn about these new people. Most of us are taught that words help us to learn about the world when we are children. But thoughts and words are a sheer reaction to the outside world. Therefore, the individual True Nature of each person in the circle is not present. They are each effectively a constellation of words and thoughts and skin. Mahayana Buddhism (or the Mahayanas) can be defined as a major movement in the history of Buddhism which has its origins in India. It comprises many schools and reinterpretations of fundamental human beliefs, values and ideals, not only those of the Buddhist teachings themselves. The recorded starting point for Mahayana, known also as the ‘Great Vehicle’ (Maha meaning great, yana meaning cart or vehicle in Sanskrit) because it embraces so much, is 2nd century C.E., but it is assumed that this tidal wave of shifts began to grow before that date building on existing schools and systems. The exact origins of Mahayana Buddhism are still not completely understood because it is so broad and encompasses so much. To help to clarify this complex movement of spiritual and religious thought and religious practice, it may help to understand the 3 main classifications of Buddhism to date: Theravada, Mahayana and Vajrayana. These are recognized by practitioners as the 3 main routes to enlightenment (Skt: bodhi – awakening; Jpn; satori or kenshö), the state that marks the culmination of the Buddhist religious path. The main countries which practice Buddhism currently are China, Japan, Korea and Vietnam. Tibetan Buddhism due to the Chinese occupation of Tibet (June 1950) has been adopted by international practitioners in a variety of different countries. The main schools of Buddhism or Mahayanas practised today are: Pure Land, Zen, Nichiren, Shingon, and Tendai; Tibetan Buddhism is classified as Vajrayana (the Vajra vehicle, focusing on the Tantric teachings, a set of advanced and mysterious techniques to bring practitioners to enlightenment quickly). It is significant that Theravada texts appear exclusively in Pali (thought to be the spoken language of the Buddha’s lifetime) and concern the Buddha’s life and early teachings; whereas, due to widespread propagation (spreading of the teachings), Mahayana and Vajrayana texts appear in at least 6 languages. Mahayana texts contain a rich mixture of ideas, the early probably composed in south India confined to strictly monastic Buddhism, and the later written in northern India and no longer confined to monasticism but lay thinking also. The term ‘Mahayana’ was first mentioned in the Lotus Sutra (among the final teachings of Buddha Shakyamuni, the historical Buddha) at an indeterminate date between 5th and 1st century C.E. However, according to recent scholars, it may have been a mistaken term because instead of ‘yana’ meaning ‘vehicle’ or ‘cart,’ it could have been mahajana, ‘jana’ meaning ‘knowing,’ therefore ‘great (maha) knowing.’ In this era, the Dharma, (Pâli: Dhamma), the natural law of all existence according to Buddhism, was no longer regarded as a doctrinal element but as a medicine that would heal all worldly suffering. The main tenets of this epoch of Buddhism are compassion (karunā) and insight or wisdom (prajnā). The perfection of these human values would culminate in the Bodhisattva, a model being who devotes him or herself altruistically to the service of others; in contrast is the preceding pursuit of self-interested liberation (Hīnayana or Sravakayana). The term Hinayana has been incorrectly referred to as the ‘Small Vehicle’ (in contrast to the ‘Great Vehicle’), but ‘Vehicle of the Hearers’ or Theravada is perhaps more appropriate, ie. those who follow the teachings of the Buddha exclusively in order to become enlightened. Compassion can be tangibly used by Mahayana practitioners in the transfer of merit to all sentient beings which is accumulated through devotional practice. Wisdom or insight can be used to transcend the human condition via the conviction that all beings have been sown with the Buddha seed so can, therefore, become a Buddha. The basis of the Bodhisattva vow is the 6 paramitas (Skt:perfections): generosity (dãna), morality (śīla), patience (ksãnti), courage (vīrya), knowledge (jñãna) and intuitive insight (prajñã). In early Buddhism, there were 10 paramitas and later in the Mahayanas they were increased again to 10 to match the 10 stages (bhūmi) of a Bodhisattva’s spiritual progress. Liberating or saving those who were lost or suffering becomes the sole life-purpose of those who take this Bodhisattva vow, even today. Another feature of Mahayana Buddhism is the presence of stūpas – religious towers or domes which evolved from pre-historic burial mounds and eventually had tall spires becoming known as pagodas, common structures found throughout Asia. Buddha Gautama instructed that on his death a stūpa should be constructed over his relics. Today, surviving stūpas often contain sacred objects such as texts as well as relics or remains of revered beings. Their popularity as representing a place of worship increased as Buddhism spread to the masses who were illiterate laymen (see my article Chunda: the first lay Buddhist https://niume.com/post/118268) On the inside walls of stūpas pictures were inscribed and sculptures made depicting the life of Buddha and his previous lives as a bodhisattva. Biographical literature of the Buddha first appeared during this Mahayana era and aided the rapid spread of Buddhism across the Silk Roads to the east of India and north into Nepal and Tibet. In addition, Buddhist poets expressed their faith using literary expressions which transcended the doctrinal lines between the different schools. The new Mahayana epoch long after the Parinirvana (death exclusive to a Buddha) of Buddha Gautama was accompanied by a canon of scriptures or sutras known as the Prajna-paramita Sutras (‘Perfection of Insight’). They are characterized by the doctrine of emptiness (Skt:sūnyatā) which entails viewing Buddha for the first time as a supernatural being worthy of devotion. This later led to the doctrine of his nature as the trikāya or three wheel bodies – the Dharmākaya (the enlightenment or truth body), the Sambhogakāya (the bliss or clear light body) and the Nirmānakāya (the form body manifesting in time and space). After this, new schools started to appear such as the Mādhyamaka, the Yogācāra, the Pure Land tradition, and the Vajrayāna. Mahayana Buddhism is prevalent in north Asia having spread from northern India, then to Tibet and central Asia, China, Korea and lastly Japan. Due to the cultural influences and diversity of countries, the scope of Buddhist practice has widened even more to include: the Tantric practices – (Tantra meaning techniques to reach Enlightenment more quickly) and Shamanism – (a shaman is an intermediary who has access to the world of spirits and healing) from central Asia; Taoism and Confucianism giving rise to the Ch’an school of contemplation in China and Korea which developed eventually into Japanese Zen, and so on. Notable figures of this movement are: Aśvaghosa who wrote ‘The Awakening of Faith in the Mahayana’ translated into Chinese circa 550 CE; Maitreyanātha who compiled the ‘Mahayana path from the Yogācāra perspective’ made up of 800 verses; Nāgārjuna, founder of the Mādhyamaka school, born in circa 2nd century in south India and Aryadeva, his foremost disciple; Dõgen known for his teachings on Buddha Nature in Japan; Kūkai, founder of Shingon Buddhism in Japan; and Huayan for the ‘Flower Garland’ tradition in China, Korea and Japan. In the 21st century it is estimated that 488 million (9-10% of the world population) people practice Buddhism. Approximately half are practitioners of Mahayana schools in China. Mahayana Buddhism continues to flourish. The frail Buddha Shakyamuni, known as Gautama Buddha and the Historical Buddha, had reached the end of his physical life and long teaching career. He and his close disciples decided on his final resting place under the twin sala trees in Kushinagar, the republic of Malla in North Eastern Ancient India. There he lay on his side surrounded by many dignitaries and enlightened monks who had gathered to say farewell to him, (c. 563 or 480 BCE). Among them, there was a deeply devoted lay follower named Cunda (Chunda). He was the son of a blacksmith from the nearby area of Kushinagara castle who had come of his own accord to pay his respects to the great Buddha, bringing with him 15 of his friends. To show his devotion, Chunda had discarded his daily work clothes and put on a simple robe, bearing his right shoulder in the traditional way of monastics. He knelt on his right knee and bowed at the feet of the Buddha. He then made a speech confidently and sincerely which was to change the future course of Buddhism. As all those attending had done, Chunda implored the Buddha to accept the simple customary offerings of homemade food he and his friends had brought. All the distinguished members of the congregation had already offered luxurious gifts of precious commodities like livestock and gold, but the Buddha had refused to accept everything until this point. Suddenly, to everyone’s surprise, Chunda’s modest offerings were accepted and he proceeded to eloquently express his deep sadness of himself and his 15 friends at the prospect of losing the Buddha. He hoped that the simple food would prepare him for entering Parinirvana, the highest state of the ceasing of all craving, and that all sentient beings would not suffer from spiritual poverty after his decease. His words displayed great wisdom despite his lack of formal education or spiritual training. He knew that all living beings needed simply the rain of the Dharma to make them spiritually fertile, and that the Buddha, the truly awakened one, the Tathagata, could bring such rain into the human world of suffering (samsara). The Buddha was delighted and immediately conferred eternal life and connected him to the ever-presence ( Skt. ; dharmakaya). In other words, he was enlightened on the spot. During his ministry the Buddha had insisted that his disciples should leave their ordinary life and become monastic practitioners, learning strict moral discipline (Vinaya) and upholding monastic rules. The assembled disciples who had reached the pinnacle of all spiritual training were looking on as Chunda, a lay person and an ‘untouchable’ – a person outside the caste system – became immediately enlightened with no training and therefore supposedly little virtue. Chunda became the exception that was to be a crucial part of the Buddha’s last will and testament as he moved back to the spiritual source. THE UNPRECEDENTED ENLIGHTENING OF CHUNDA, A LAY PERSON AND HOUSEHOLDER, WAS TO OPEN THE PATH FOR ALL BEINGS, NO MATTER WHAT THEIR CASTE. There were two ways in which this moment in the history of Buddhism brought fundamental changes to the aspirations of Buddhists. Firstly, this unprecedented enlightening of Chunda, a lay person and householder was to open the path for all beings, no matter what their caste, whether lay or clerical, to aspire to reach Nirvana (or enlightenment). It is easy to imagine just how radically this changed the course of Mahayana Buddhism because now anyone could become enlightened and many lay Buddhist orders emerged later. Secondly, Chunda became enlightened within his own lifetime as a relatively young man. He did not have to work hard to accrue merit and virtue in order to become enlightened in a future lifetime, which was the prevailing Brahmin belief at the time. The Buddha’s acceptance of humble Chunda’s offerings was symbolic of the fact that all sentient beings are endowed with Buddha Nature, and that when the rain of Dharma waters the seeds of Buddha Nature, they will ripen, cutting away all negative karma and human suffering. By bringing so many of his friends in a sincere gesture of reverence to the Buddha and by having the confidence to make his offering in front of all the dignitaries and esteemed disciples, he had exhibited the spirit of a Buddha, without training or privilege. This comment prompted the Buddha to leave his final instructions before shifting into Parinirvana. His final teachings known as the Dharmakaya focused on impermanence and detachment followed. He left them in place of his physical body, assuring the grieving congregation that he would always be with them embodied in the last teachings and that these final teachings would exist for all eternity because they were indestructible. A recent sculpture of Chunda in the Sala Grove with his 15 friends executed by a modern Japanese sculptor is an inspiration for Japanese Buddhists of Shinnyo Buddhism whose principal belief is that all beings are capable of polishing their Buddha Nature and reaching Nirvana. Chunda’s deep humility and sincere heart radiated out beyond that of the advanced practitioners and enlightened who had perhaps become arrogant or complacent. This indicates that practising as a true Buddhist of the heart is not about worldly success and reputation, but about humility, sincerity, and simple but total belief in the power of loving goodness and pure faith in the world. The character of Chunda marks the beginning not only of lay Buddhism but also a prevailing feature of the Mahayanas of Buddhism (2nd century CE onwards), the Bodhisattva who achieves enlightenment for the sake of all other beings and vows to postpone his own enlightenment until universal enlightenment is reached. 2600 years ago, under twin Sala trees among all the dignitaries and enlightened monks gathered to say farewell to the Buddha Shakyamuni, there was a deeply devoted lay follower named Chunda. He was the son of a blacksmith from the nearby area of Kushinagara castle who came to pay his respects to the Buddha, bringing with him 15 of his friends. To show his devotion, he had discarded his daily clothes and put on a simple robe, bearing his right shoulder in the traditional way of monastics, kneeling on his right knee and bowing at the feet of the Buddha. He then made a speech confidently and sincerely, which was to change the future course of Buddhism. In essence, he begged the Buddha to accept the simple offerings of homemade food he and his friends had brought. All the distinguished members of the congregation had already offered luxurious gifts of precious commodities like livestock and gold, but the Buddha had refused to accept everything until this point. To everyone’s surprise Chunda’s modest offerings were accepted. Chunda eloquently expressed his deep sadness at the prospect of losing the Buddha and begged him to accept the offerings from himself and his 15 friends before he entered Parinirvana, the special Nirvana only Buddha’s can enter, so that all sentient beings would not suffer from spiritual poverty. Chunda’s words displayed great wisdom despite his lack of formal education or spiritual training. He knew that all living beings needed simply the rain of the Dharma to make them spiritually fertile, and that the Buddha, the truly awakened one, the Tathagata, could bring such rain into the human world of suffering (samsara). The Buddha was delighted and immediately conferred eternal life on him and connected him to the ever-presence. In other words, he was enlightened on the spot. The Buddha during his ministry had insisted that his disciples should leave their ordinary life and become monastic practitioners, learning strict moral discipline and upholding monastic rules. The assembled disciples who had reached the pinnacle of all spiritual training were looking on as Chunda, a lay person, and an ‘untouchable’ – a person outside the caste system – became immediately enlightened with no training, and therefore supposedly little virtue. Chunda became the exception that was to be a crucial part of the Buddha’s last will and testament as he moved back to the spiritual source. There were two ways in which this moment in the history of Buddhism brought fundamental changes to the aspirations of Buddhists. Firstly, this unprecedented enlightening of Chunda, a lay person and householder(someone who had not given up ordinary life or entered a monastery), was to open the path for all beings, no matter what their caste, whether lay or clerical, to aspire to reach Nirvana (or enlightenment). It is easy to imagine just how radically this changed the course of Mahayana Buddhism because now anyone could become enlightened, and hence the emergence of many lay Buddhist orders later. Secondly, Chunda became enlightened within his own lifetime as a relatively young man and did not have to work hard to accrue merit and virtue in order to become enlightened in a future lifetime, which was the prevailing Brahminbelief at the time. The Buddha’s acceptance of humble Chunda’s offerings was symbolic of the fact that all sentient beings are endowed with Buddha Nature, and that when the rain of Dharma waters the seeds of Buddha Nature, they will ripen and all negative karma and human suffering will be cut away. By bringing so many of his friends in a sincere gesture of reverence to the Buddha, and by having the confidence to make his offering in front of all the dignitaries and esteemed disciples, he had exhibited the spirit of a Buddha, without either training or privilege. In other words, this courage and wisdom was a facet of Chunda’s true nature, and thus true human nature is Buddha Nature. The Buddha’s exclusive mission was to liberate all beings from the sufferings of being a human. This comment moved the Buddha to leave his final instructions before shifting into Parinirvana. His final teachings on impermanence and detachmentfollowed, known as the Dharmakaya, which he left in place of his physical body. These final teachings would exist for all eternity and were indestructible. Chunda is especially significant to my own spiritual journey. During my lengthy Buddhist career, I can trace the beginnings of my Buddhist faith to the sea turtle that Chunda mentions. As a young child in urban Britain, I heard this maxim on a radio program and retained it as I searched for a way into Buddhism without any leads. I was a quite devout Christian through my family’s influence, but the Buddha, even though at that time I had no idea what or who it was, somehow penetrated into my unconscious mind and I began to yearn to receive the teachings and become a disciple. I had neither Buddhist friends nor contact with the Buddhist teachings in northern working class Britain in the sixties, and yet, I was certain that I would be like that turtle, and that one day I would find the Buddha. The Buddha’s revelation that even lay people and women, in fact, anyone, could train spiritually and so enter enlightenment is also pertinent to my case. As a Tibetan Buddhist in the Kagyu lineage, I was intent on taking vows and becoming a Lama, but at the final stage I had a tiny doubt about committing myself to monastic life because I felt the best training ground to learn how to love unconditionally, was in ordinary human life. I searched to find a lay order so I could fully devote myself to humanity. Also as a woman, as is commonly known and still the case in some lineages, there was no equal treatment with men. Finally, the Nirvana teachings have found me in Japan, and I am fulfilled and engaged in normal human life while holding a priestly rank, and serving at the Temple whenever possible. In Japan, for historical reasons, Buddhism has been and continues to be perceived as training for the elite or monastics only, so my order is working hard to make Mahayana Buddhist practice accessible to all Japanese people and people of the world. It is a challenge to guide Japanese people of great humility to have the confidence to practise rituals that were once only available to the Imperial family. Kobo Daishi, or Kukai, was responsible for single-handedly bringing Buddhism to Japan from China in 9th century, but at that time the national popular religion was Shinto, and it remained so until 1945. Here, in modern times, Buddhism has become the principal means of conducting funeral rites within society, but the main emphasis on Buddhism still lies in monastic practices at a distance from general society. Chunda then, is a seminal figure in my Dharma stream. We aspire to do as he did: to bring as many people as possible to the other shore of Nirvana. A recent sculpture of Chunda in the Sala Grove with his 15 friends executed by a modern Japanese sculptor, Nakayama Hideo, is one of our objects of devotion. It is truly inspirational. The Buddha’s acceptance of the final offerings of a lay householder and untouchable signalled the very final instructions, which could not have been revealed before that moment. The essence of them is that we must each learn to control our own minds; our minds determine our behaviours in the world, either as a self-serving beast or a magnanimous and compassionate Buddha. We must rid ourselves of human passions, driving them out of our rooms as if they were poisonous vipers. He then reassures everyone that his death is only of the flesh – as it was born and nurtured by parents, so it must deteriorate and perish – and that Buddhahood is not of the flesh, but of the spirit. The final teachings were to become the body of the Buddha –the Dharmakaya – and he begs all his disciples to preserve them just as they had followed and cherished him in life. In doing so, the Dharma Body of the Tataghatas will be ever-present and so never disappear. Chunda’s deep humility and sincere heart radiated out beyond that of the advanced practitioners and enlightened who had perhaps become arrogant or complacent. So we can learn from this that practising as a true being of the heart is not about worldly success and reputation, but about humility and sincerity, and simple but total belief in the power of loving goodness and pure faith in the world. I believe we are all Chunda. Even if we have low status and are poor in materialist terms, even though we might have shortcomings and little knowledge, everyone has the capacity to love all beings unconditionally and indefinitely, and this is our principle mission in human life – to become a Bodhisattva – the embodiment of spiritual ideals. images courtesy of Megapixyl: Chunda sculpture – Shinnya Nakamura – permission to use from Shinnyo-en, Tachikawa, Japan. We need to work so hard to get approval from our societies at large. If we are different and honest about our differences, then we are shunned. There is silence when we walk into a room, averted eyes, deliberate disinterest displayed. We are a threat to the masked committees and there will be no compassion, no concessions of any kind until we decide to put aside our honesty and our difference, put our masks back on, and behave in the interests of uniformity and social rank. How can we expect to be accepted if we are living our true nature? Social groups are often empty and congealed with their dishonesty, so the members busy themselves auditing credentials. Is their behavior exemplary according to the rules? But most important of all, what are their sexual proclivities and urges? They form a group but they are separate liars behind their masks. To live according to your true urges and nature takes enormous courage and the dropping away of all fear. But you are no longer separate when you refuse to lie and go along with other fabrications and bullying. You are integrated into the flow of goodness and love, back swimming in the river instead of sitting on the banks. We may not get approval but we have been honest with ourselves and that matters more than anything. Entering the world of form, our spirits need a clear purpose. They need to bring light, but also be a model of self-truth for others, bringing the light and holding it high so others can ignite their own lights. Buddha clearly instructed that we should not associate with those who gossiped and bad-mouthed others. We should avoid negative influences; we should stay silent rather than talk carelessly, but we can use eyes and hands to gently display our purity and inspire courage with our own courage while we do so. We should not be scared of losing our reputation and not say anything detrimental about others because it only makes us look better in people’s eyes. We have above all to be true to ourselves. How else can we be honest with others if not? The tiny hummingbird moves around so quickly and quietly that it is almost impossible to detect. It takes the pollen it needs from the bells of tropical flowers and then moves on its way unnoticed. It does not disturb anyone or anything. This is how we should live, quietly, stealthily, without making any disturbance. But many of us put so much energy into interfering in other people’s lives and business when we should be just playing with light and love. We take life so seriously, trying to teach others and instruct, to over-protect them, when they could instead just notice our playful lightness and imitate us. All we need to be careful of is obstacles which break the flow of energy. We allow others to tear us away from integration, to distract us from our breathing and our awareness. They deter us with their needless words and gestures from our gratitude and awe for our existence and all things natural. Our core should be solid and not so easily distracted from its joy and contentment. After all, we are so lucky to have become flesh and been given so many opportunities and messages to elevate ourselves spiritually. I’ve recently been interviewed about my spiritual journey on Voice of America, 7th Wave. If you want to listen rather than look for a change, this may be very centering. Please join me as host Gilles Asselin, my spirit mate, interviews me.